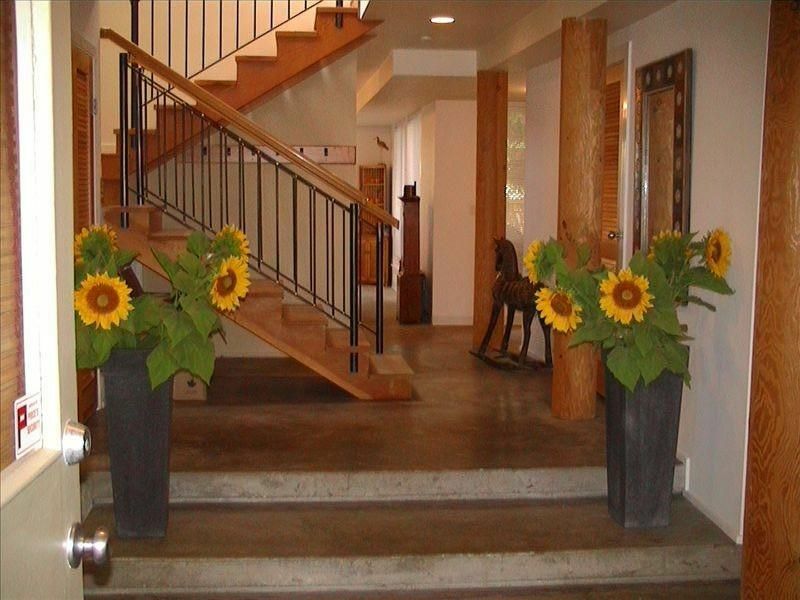 This unique, artistic, beautiful house is located on a quiet, tree lined street in JAMES BAY, half a block from the ocean and only a 10-15 min. walk to the inner harbor and downtown Victoria. You do not need a car to enjoy your holiday in Victoria in this location!. Cruise ships line the docks and miles of beaches are there for you to enjoy. The house is 2300 sq feet (1150 sq feet on two levels) . It is very light, open concept, and a beautiful mixture of 'West Coast meets Urban living' (old fir beams and polished concrete floors, modern kitchen/bathroom and old fir floors). Upstairs are 3 bedrooms, all with queen sized beds, cozy down filled duvets, open concept kitchen and living room that stimulates your senses with its harmonious use of colors, textures, Art, and attention to detail. The owner is an artist/textile designer from Germany and her house is an expression of who she is. There is a bathroom with a claw foot bathtub upstairs and a second bathroom with a large shower stall downstairs. Downstairs there is a large second living/TV/piano/reading room with heated flooring and lots of daytime light. There is another large room that leads into the courtyard that serves as the 4th bedroom with bunk beds and would make a great playroom for the kids/teenagers. What else is there to say...the pictures will speak for themselves I think. This will feel like a home away from home and the location is perfect if you enjoy experiencing the cultural events, fine dining and city life of Victoria in combination with the ocean, kayaking, beaches etc. half a block away. Enjoy! When my daughter and her young family moved to Victoria in 2005 (from Toronto), I decided to spend half my time in Victoria and half in Ontario. I fell in love with this house which is a perfect blend of modern and old/character. I loved the location since I don't drive and could do all my shopping in James Bay Village or Cook street village and walk downtown within minutes. I have since moved to another place, but my daughter manages the house and uses it for occasional house/jazz concerts when the rental season is slower (ie winter). The house is light, spacious, open and was easy to decorate , which I love to do. I enjoy being so close to the ocean and going for a morning walk. I often stop for coffee or lunch at the Ogden point cafe (on the ocean!) and enjoy watching the cruise ships dock at the pier. I can do all my shopping in James Bay village which is merely a 5 min walk away. I love walking to Beacon hill park (7 min walk) , the petting zoo, ponds and playgrounds (2) with my granddaughter and enjoy the beautiful peace and beauty of the West coast nature. The inner harbor with great restaurants, street performers , buzzing night life, parliament buildings, The Royal B.C museum and Imax theatre, and summer festivals is just a 10 min walk from my house. I appreciate beauty, harmony, simplicity and color and my house is an expression of my inner world. I enjoy the spaciousness of this house with many choices of rooms to sit, read, enjoy company, make art, play piano or watch a movie. Forced air Gas (new furnace) and heated tiled flooring downstairs in living area. Cozy living room upstairs with lots of light that seats 8 people on the comfy leather couches/chairs- can add chairs. Coffee machine for 10 people. Small espresso maker (italian) for on the stove. Spices, sugar, tea, coffee, paper towels, aluminum foil, wrap, etc. Matching yellow plates and dishes from Denmark and artistic cutlery chosen by an artist/designer. Full kitchen with all amenities like at home. Magic bullet smoothie maker. One smaller flat screen in Masterbedroom (hidden in cabinet) One larger TV in downstairs living room. Cd player/radio with speakers in dining room. Some CD's available for your use. Romantic, intimate small balcony protected by the large curly willow in front of the house- great morning sun- nice for breakfast for two or three. Cozy, private courtyard garden in the back with teak garden furniture that seats 8 Two lounging chairs with pillows for your afternoon sun/reading break.